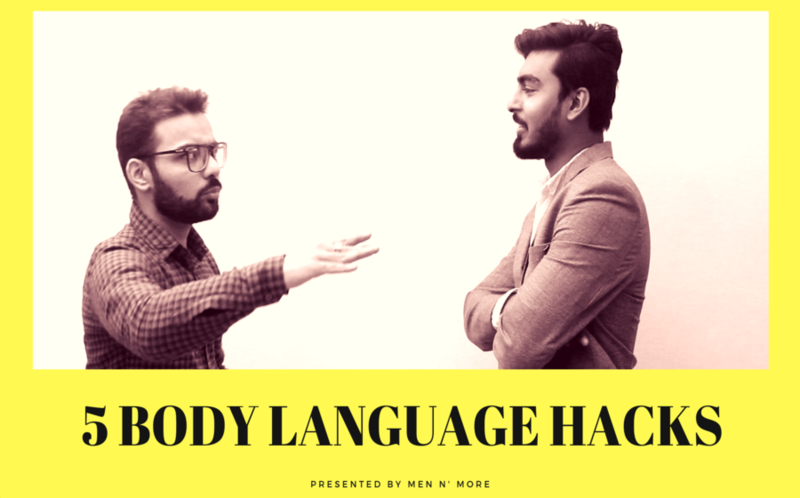 Here are 5 manly body language hacks that you can learn and master to appear confident. These are basic body language tips that you can develop just by practicing them on a daily basis. Slouching has become a problem of this generation. We are mostly stuck to our smartphones and computers at is causes our shoulders to slouch forward. Fixing your shoulders by pushing them back and pushing your chest out a little bit, not only do you look taller but also makes you appear confident. Open body language is welcoming, less intimidating and confident. Practice expanding and not closing or constricting yourself. A closed body language or posture sends off a signal that you are insecure and bet you don’t want to come off as a confident guy. So, open your arms and spread out a little bit. Maintaining friendly and strong eye contact is a sign of confidence. If you struggle to maintain eye contact with people while conversing with them, you can take your confidence game from a 2 to 11 just like that. Become slower guys. Become self-aware and aware of your actions and movements. You don’t react to the environment, the environment reacts to you. A slow and composed body language makes you appear confident and attractive. You guys are awesome and you only deserve the best and this is why we create content that you can benefit from and use them to grow in beautiful men. Please share your feedback as we love knowing, how do you feel about the videos and the content we create. Don’t forget to subscribe to our channel and leave us a like.